Published in MIT's Architectural journal Thresholds, “Party: Ecological architecture for intimate relations,” presents an understanding of party as an architectural medium with the potential to cultivate intimacy between individuals and the liveliness of their environments. The essay elaborates on philosophies and techniques embedded in Nocturnal Medicine's ongoing party series, Dark Freak, laying out an argument for party as a method for the collective accessing and processing of ecological feelings. The piece concludes with an invitation: the reader has been invited to a party. 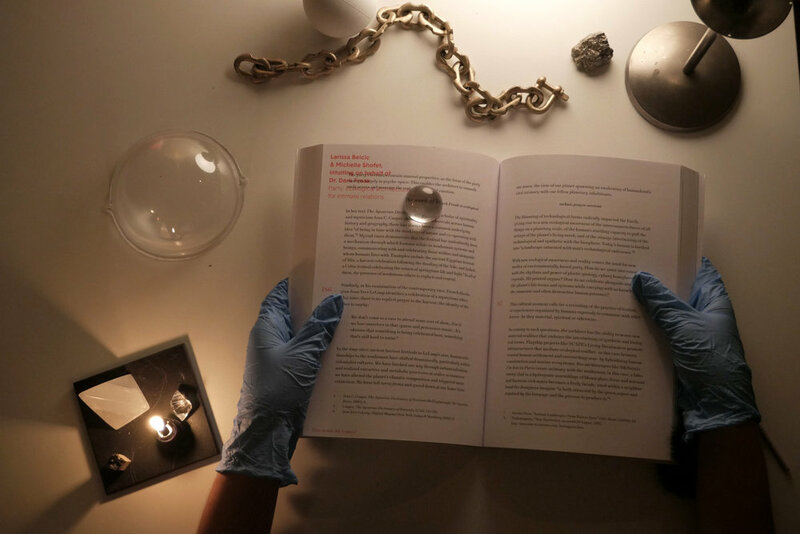 As a companion piece to the essay, Nocturnal Medicine produced a rave for ecological grief at MIT School of Architecture & Planning soon after the publication of the journal. The party, served as an experiential form of the essay, aiming to bring attendees into intimate relations with their own community and the ideas of the essay. Location _ Belcic, Larissa, and Michelle Shofet. "Party: Ecological Architecture for Intimate Relations." Thresholds. 46 (2018): 184-189. Print.